View southwest of a factory owned by the Consolidated Lithograph Company. 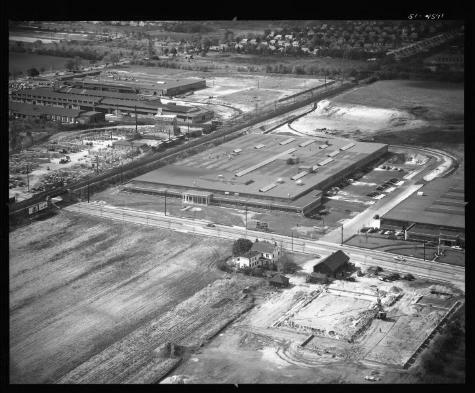 The building on the right is identified as Woodall Industries and on the left as Island Building Block Corp. In front of the building, the Long Island Railroad (LIRR) crosses above Glen Cove Road. Another building, houses and fields are also in view. To the upper right is the Long Island Motor Parkway bridge. Source: New York State Archives, Aerial photographic prints and negatives of New York State sites, 1941-1957, B1598-99. Box 5, Folder 54, no. 51-4591.